Last week, we kicked off a five-week educational series about speeding up your business in a slowdown. This week, you'll hear tips from Ricardo Prada, a user experience researcher at Google, about designing for the user. As we continue to share tips about attracting more visitors, increasing your revenue potential, and attracting more advertiser budget, we invite you to share your own suggestions for growing your business by leaving comments on each post. You can also follow the series at www.google.com/ads/speedingup. Hi, I'm Ricardo Prada. As a user experience researcher here at Google, one of the things my colleagues and I are responsible for is making sure that Google websites are efficient and fun to use so that visitors keep coming back to them. I'd like to share three tips we think about daily as we do our jobs. Ultimately, they all fit into our guiding principle: if you focus on the user, everything else will follow. Tip #1: Design for the tasks that visitors complete on your site. Think about tasks on your website first and layouts second. It's tempting to want a flashy design that exercises your CSS skills, but remember that vistors come to your site with specific goals in mind, like reading your essays, or checking out your collection of sports photos. Write down the top three tasks your users might want to accomplish on your site, and design to make those tasks quick and efficient. Tip #2: Use ads as potential exit paths, not interruptions. Ads should complement your site, not distract from it. The most natural place for a user to evaluate an advertisement is after they've completed their goals on your site. Instead of interrupting your user's main tasks, try to offer ads as potential exit path for users who were probably ready to leave anyway by placing them at the end of completed tasks. Tip #3: SEO - only if it makes sense. Only do search engine optimizations that benefit your users. For example, page titles that are relevant to the page content make it easier for your visitors to understand what your articles are about. On the other hand, there are lots of sneaky strategies out there for improving search engine rank. Most of those don't work anymore, and they might actually harm your site's reputation. Our Help Center has more suggestions about where to place ads. The Google Webmaster Tools team shares their design and content tips.
. Again, we recommend testing these new font size options with your existing customizations to determine which combinations perform best on your pages. As a follow-up to last week's launch of font size controls, we'd like to let you know that we've just increased the default font size for AdSense ad units. This change will affect your ad units if you haven't yet customized your font sizes, or if your ad units are set to 'AdSense default font size' -- you'll notice that the text in your ad units is now the equivalent of 'medium' instead of 'small'. We decided to make this change based on publisher feedback and our testing, which showed that this increased font size improved performance. If you'd like to change the font size in your ad units, you can do so on an account-wide basis or by individual ad unit -- just follow the instructions listed in our Help Center. Again, we recommend testing these new font size options with your existing customizations to determine which combinations perform best on your pages. Today, we're kicking off a five-week educational series about speeding up your business in a slowdown. We'll be revisiting the basics of online publishing to help you grow your business, and we'll share tips about using AdSense and other Google products that you can apply to your business now. In the coming Thursdays, you can look forward to tips for making your site more user-friendly, bringing in more visitors, increasing your revenue potential, and attracting more advertiser budget. Along the way, we invite you to share your own suggestions for growing your business by leaving comments at the end of each post. You can also follow the campaign at www.google.com/ads/speedingup. In today's post, you'll hear from Avinash Kaushik, Google's own Analytics Evangelist, about the importance of understanding your traffic, analyzing how your site performs, and using data to make decisions. Here are a few small to mid-sized ideas that -- in Avinash's own words -- can add up to remarkable results for your website. They're all things you can do today with free web analytics tools, like Google Analytics. Idea #1: Discover what content and traffic sources keep people coming to your site again and again. How many times does a visitor have to visit your site to be considered valuable? 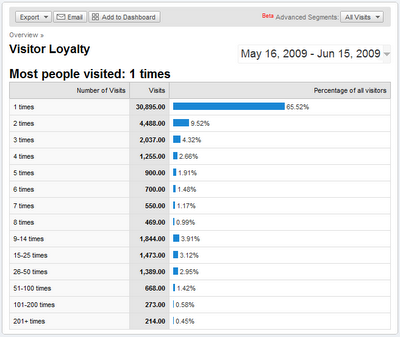 Use the Visitor Loyalty report in the Visitors section of Google Analytics to pinpoint the visitors who come to your site that many times or more. Put that data into an advanced segment and apply that segment to your core reports to understand things like where these valuable visitors come from and what content they consume. You can then use this information to optimize how you acquire new visitors and the content on your site for loyal visitors. Idea #2: Figure out which pages to improve on your site. Many people ask the question: "How do I know which pages on my site to improve?" Take a look at the Top Landing Pages report in the Content section of Google Analytics. This report tells you the first page people see when they enter your site. Sort this report by bounce rate. 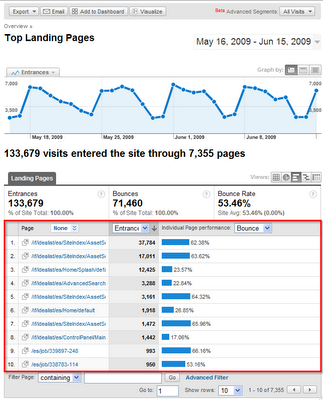 Bounce rate measures how many people come to your site, only see one page and leave right away (or as Avinash calls it: "I came, I puked, I left"). Once you identify which of your top landing pages are not able to get a single click from your visitors you know which pages need to be improved. Idea #3: Find out where AdSense performs best on your site. If you've linked your AdSense and Analytics accounts, the Top AdSense Content report in the AdSense section of Google Analytics will tell you where on your website AdSense ads get the most clicks. This is a win-win for your business and your customers, as it helps you identify what type of content to produce more of based on what content people are most interested in as well as where people most often click on your AdSense ads. If you haven't already, link your AdSense and Analytics accounts in order to take full advantage of what Analytics can offer. If you don't yet have an Analytics account, you can sign up today. Read more from Avinash at his blog, Occam's Razor, which has more tips like the above and additional ways to use Visitor Loyalty metrics, or on the Official Google Blog. To learn more about using Analytics on your website, visit Conversion University. See great ways to use AdSense and Analytics together by watching this video. , we're happy to announce that local currency reports are now also available in Australia, Austria, Belgium, Finland, Greece, Portugal, South Africa, Switzerland, and the UK. We'll be requiring this change in the future, so we recommend updating your account to report earnings in your local currency soon. You can find answers to common FAQs associated with these new local currency reports in a recent Inside AdSense blog post -- all references to 'Euros' in the post now also apply to your local currency. In addition, detailed information about these new reports can be found in our Help Center. Following our launch of Euro reporting for publishers in five European countries, we're happy to announce that local currency reports are now also available in Australia, Austria, Belgium, Finland, Greece, Portugal, South Africa, Switzerland, and the UK. with Google Analytics. If you're not very familiar with Analytics yet, you might be interested in reading a recent post on the Analytics blog that addresses ten common myths about the product. For example, did you know that you can use Analytics to segment visitor data in real time, or that you can use the new Analytics API to tie your website data to your financials? Check out the post to learn more about these features and other ways you can use Analytics to better understand your site stats. 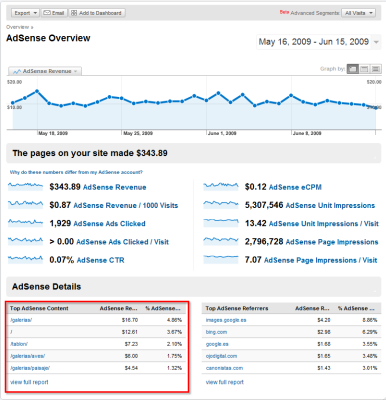 Click the link that says "Integrate your AdSense account with Google Analytics" on your Reports Overview page. Follow the onscreen instructions, and watch our video for additional guidance. Even if you use AdSense in a language that's not supported by Analytics, you can still link your accounts and view your Analytics reports in a different language. A few weeks back, we announced that all publishers can now integrate their AdSense accounts with Google Analytics. If you're not very familiar with Analytics yet, you might be interested in reading a recent post on the Analytics blog that addresses ten common myths about the product. For example, did you know that you can use Analytics to segment visitor data in real time, or that you can use the new Analytics API to tie your website data to your financials? Check out the post to learn more about these features and other ways you can use Analytics to better understand your site stats. Please be assured that you'll be credited for all valid clicks, impressions, and earnings generated, and these temporary delays will not impact the amount you earn. In addition, you'll still be able to sign in to your AdSense and Ad Manager accounts during these hours, and your ad serving and targeting won't be affected. We understand that many of you check your stats multiple times a day, and so we hope this notice helps alleviate any concern on your part. Thanks for your patience, and if you'd like to learn more about how frequently your reports are usually updated, we recommend reading this past Inside AdSense post.